I am trying to find some information regarding the Peerless fountain pen company. I recently purchased a large sleeve filler Peerless Self-Filling pen in BCHR with a decorative gold-filled band and I can't seem to find any information on it or the company itself. Did they make higher end pens as this particular pen seems to be of a high quality construction. Thanks in advance to any of those who post a responce! This link has pictures on one Peerless Pen and this link has another picture. So far, this is all I can find. Cross made a Peerless Pen in BCHR in the very early 1900s. Without seeing your particular pen, I am not sure if there is a relationship. I also do not know if there is a relationship between the Cross Pen and the one's in EventHorizon's post. I seem to recall reading that Peerless was an "upscale" sub-brand of Wearever. I will have to find out where I read that - an article in the Pennant seems to stick in my head. Or am I totally confused here? Never mind - I am thinking of Pioneer. Edited by Johnny Appleseed, 26 October 2009 - 19:15. A quick tour of Google books gives referencess from the late 1880s to the Peerless pen from Cross (as Phil M. mentioned). A 1944 issue of BillBoard magazine refers to the "Peerless Fountain Pen & Pencil Co, Inc." This makes me think that the company was not a sub-brand of Wearever. I would be very surprised if there weren't many other Peerless pens (from completely unrelated makers and jobbers) to be found around the turn of the century. As I think about it more, I think that the Wearever sub-brand was Pioneer. Oh, and that is different from Penman, which is another company. Keeping track of all those 3rd tier sub-brands can give you a headache. I don't know where my brain is this morning. Here is another Peerless, made by ALCO (Aikin-Lambert) and sold through the Sears catalog in 1913 (and other years). I have another Peerless that is nearly identical to this, but has an Eagle "Sheild" nib (and a feed that does not look like an ALCO, but that is harder to say for sure). 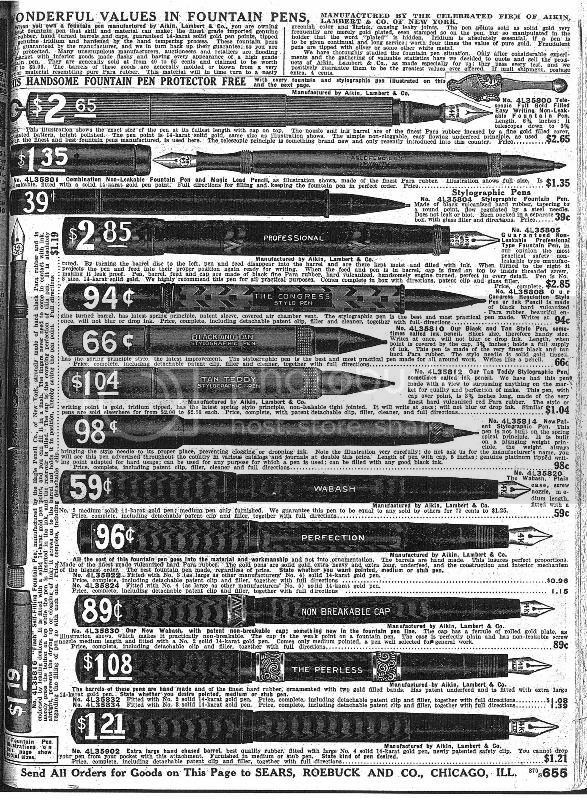 Sears had a number of names for different pens they sold that seemed to be unique Sears names, not general names for the maker. I know that sleeve-fillers show up later in the 19-teens, but I think they had different names. I will look when I get home. I doubt that this was a trademarked name - sounds like there were several Peerless pens out there, as David suggests. I think you hit the nail on the head! My pen has an ALCO nib so it has to be one of the pens made by Aiken Lambert for Sears. I'd like to post a picture of it by the posting on here still doesn't work for me, maybe I'll post it from another site and link it through. I will have to find the links again but there is information out there. Maybe not so much 8-9 years ago. I was handed one by a friend a few months ago to restore. Plastic lever filler but with what I believe is a nickel overlay with a chased pattern. I also have 3 awesome inkwells by Peerless with Bakelite covers.